For this recipe, you’ll need a mandolin slicer. And if you don’t have a mandolin slicer, you’ll need a vegetable peeler. You’ll also need a nice 1/2 bottle of inexpensive oil (vegetable or canola), a deep pan for frying, and all your fingers so you can afford to lose one or two between the slicing and the frying. Toast hazelnuts in 350 degree oven for 10-15 minutes or until fragrant. WATCH CAREFULLY as these suckers will burn. Once you smell them, take them out immediately. Set aside. 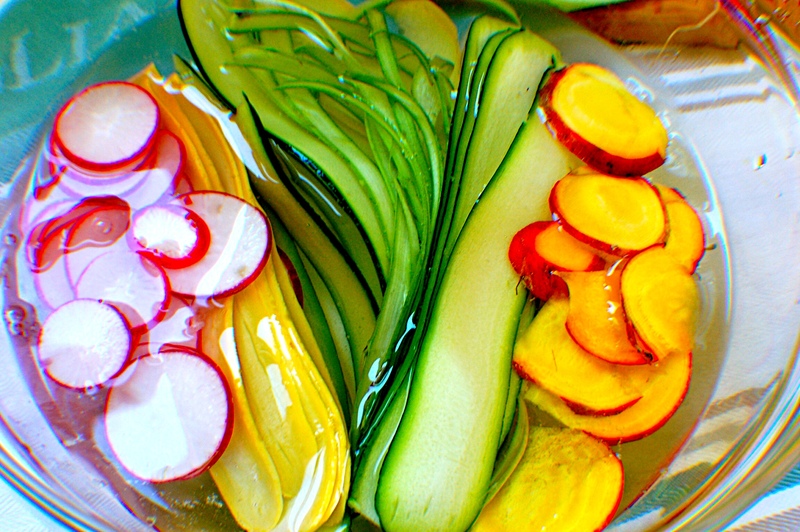 Slice zucchini, radishes, beets, and asparagus (leave tops whole for the salad) and place in a ice bath. 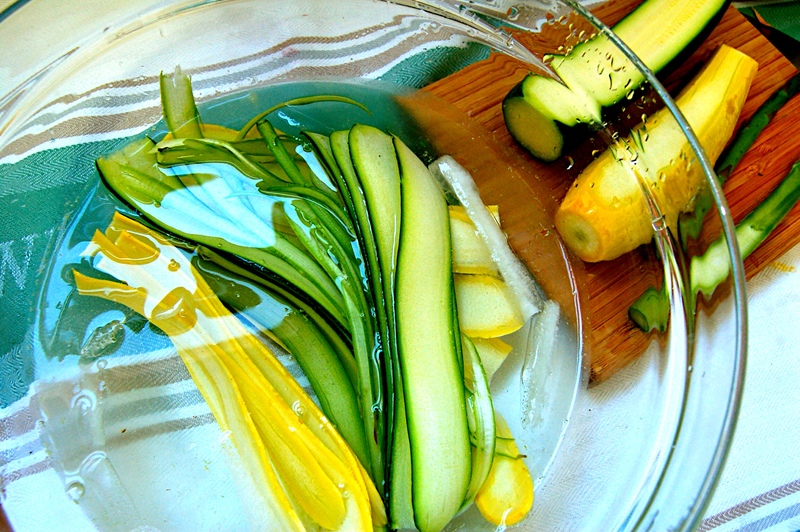 The ice bath keeps veggies fresh and makes the zucchini curl up and look purdy. Set everything aside for final preparation, below. Whisk everything together rapidly. If you’re obsessive about emulsifying (process of separating the oils with all the vinegars), do this in a mini blender. Mince herbs and mix in with goat cheese. Add S&P to taste. 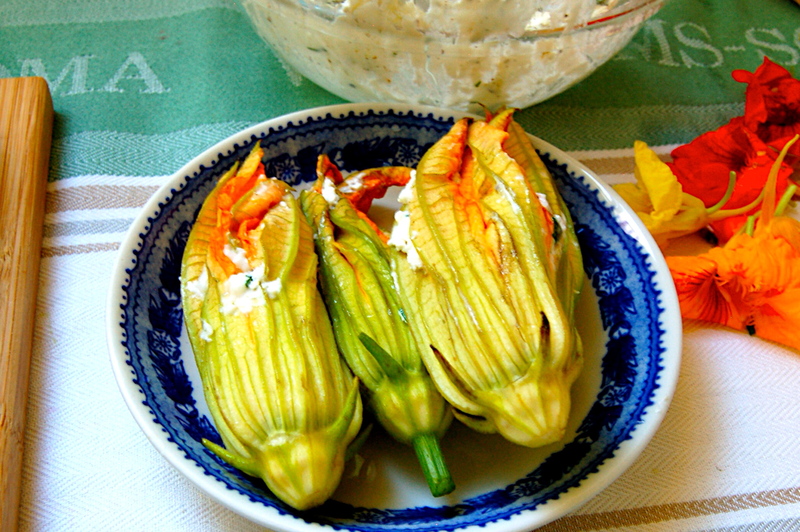 Stuff squash blossoms with goat cheese mixture, but do not over-stuff. 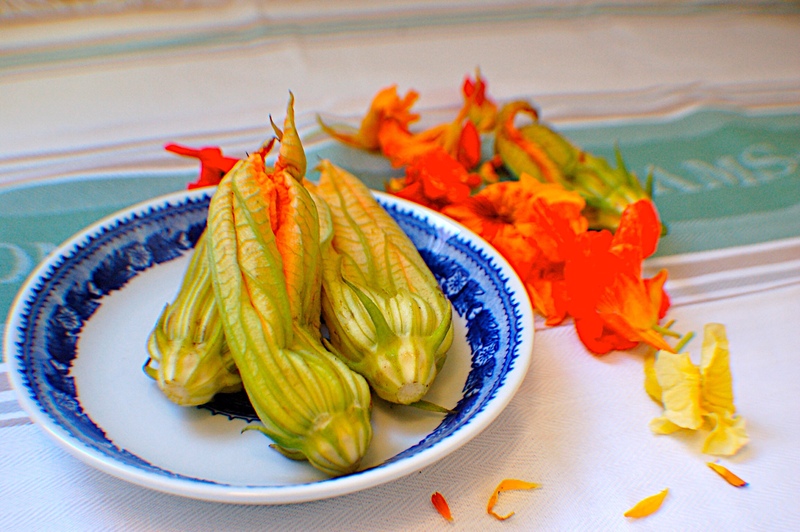 These squash blossoms should look like they ate too many chips before their enchilada at the Mexican food restaurant. NOT like they were trying to get their money’s worth with fried chicken, potato rolls, mashed potatoes & gravy and the ice cream sundae bar at Old Country Buffet. In a medium bowl, mix seltzer water with flour and a pinch of S&P. 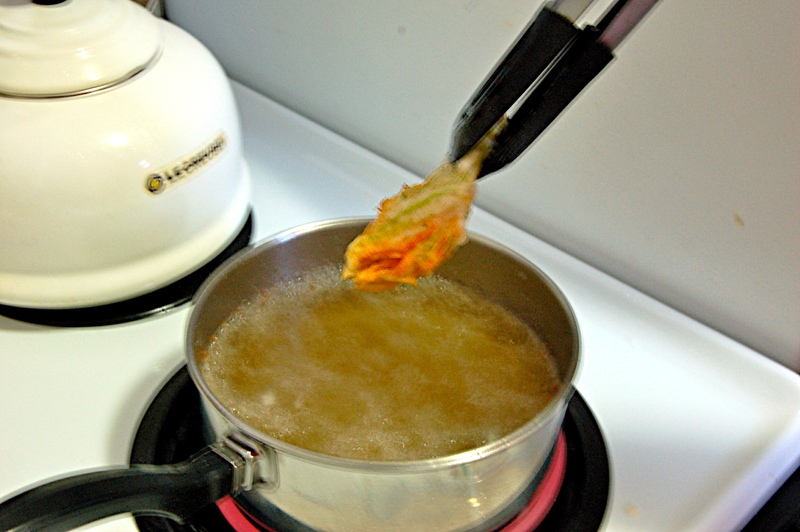 Heat oil in a fryer or deep saucepan over high medium high heat (meaning just below medium high, but not quite high). There should be about an inch of oil in the pan. Note, in the photos below I have TOO MUCH OIL in the pan. This caused splatter and a small, 1/2 second fire on my stove so don’t do that. Less oil, no fire. Ok? The oil is hot enough when you drop in a tiny bit of the flour/seltzer mix and it sizzles. 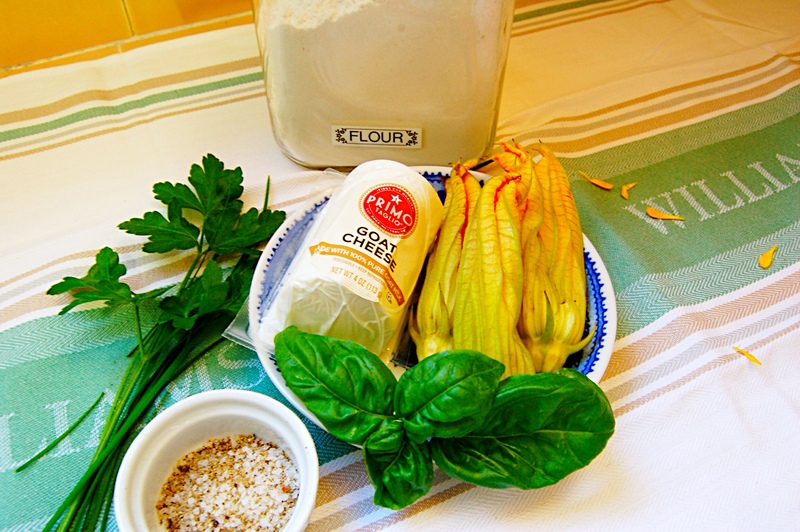 Using thongs (for finger protection), dip each stuffed squash blossom in the setlzer-flour mixture, shake off excess, and GENTLY drop into oil. Let sizzle, turning gently using thongs, until browned. 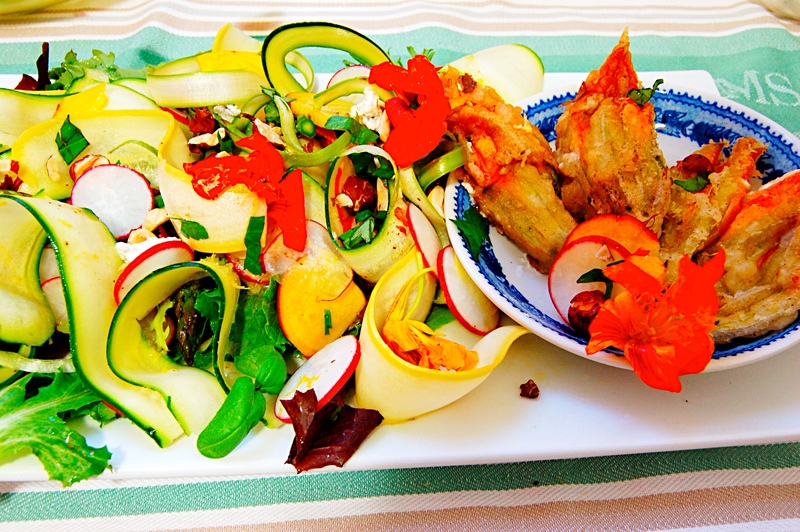 Set aside on a separate plate. 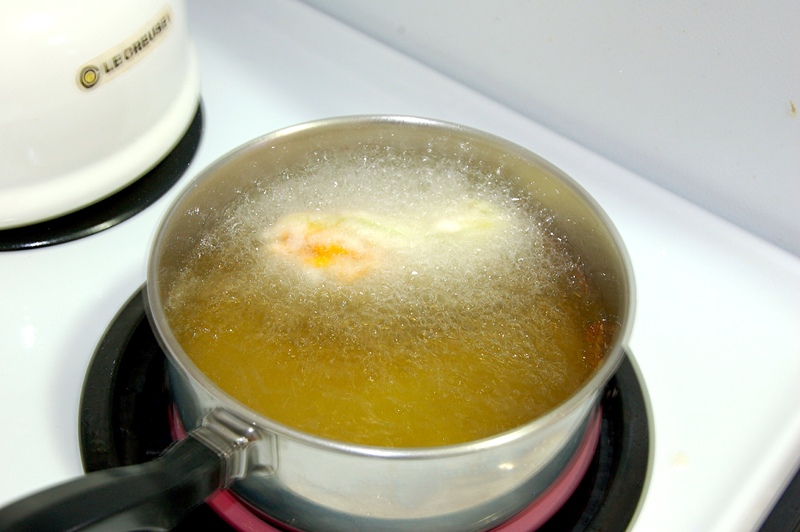 Do each blossom separately so that the oil can re-heat after each one. Dress the mixed greens with 1/2 the salad dressing. 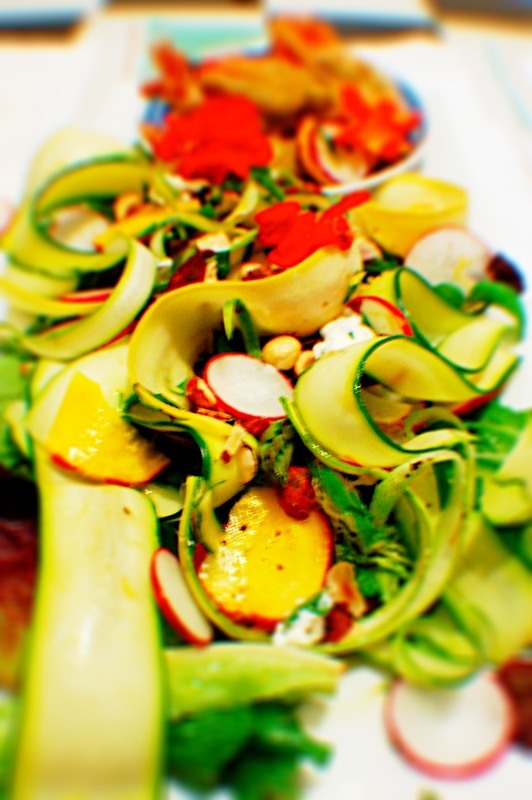 Drain remaining veggies, pat dry, and dress with remaining salad dressing. 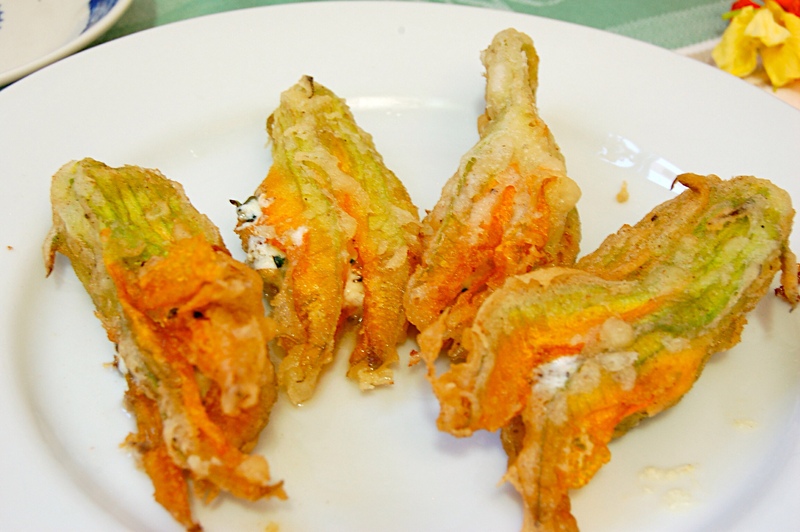 Top with goat cheese, hazelnuts, and squash blossoms. 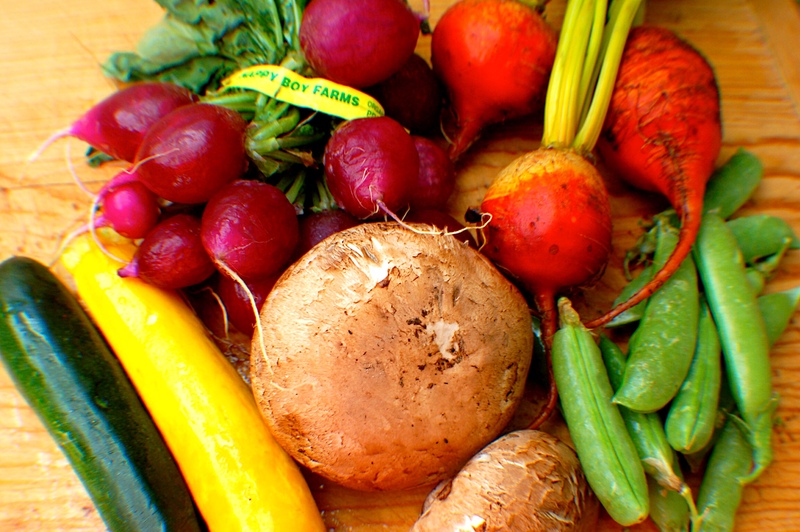 Enjoy immediately with a glass of wine and a silent cheers to all the farmers that bring us fantastic veggies to your home (wherever that may be).